This was a fun adventure as Nancy not only tries to solve the mystery of a missing grandson for a nice old woman who turns out to be secret royalty who escaped during troubling times in her home country. While searching for this missing man, Nancy finds her suspicious of many characters and the secret to the true identity lies in a jewel box with hidden compartments. Another fun mystery has Nancy searching for some old music left behind by the deceased grandson of a very nice man taking care of the young girl left behind. Nancy finds herself doing everything in her power to help the family succeed and find the riches rightly owed to them by someone stealing the music from an old mysterious attic. I especially enjoyed this one. Nancy has her hands full in this next mystery as she searches for a missing dancer who could be the only one to save a troubled young girl and her mother from poverty and despair. In her efforts, Nancy comes across some bad men who try to do everything in their power to keep her from finding the woman and claiming what is rightfully hers. When Nancy meets a mysterious man in a restaurant while helping out a friend, and finds herself searching not only for a special jeweled bell worth a fortune, all the while searching for another person who seems to be swindling people into buying shares of a company that doesn’t really exist, taking their whole life savings. Kathrin of Secret Dreamworld of a Bookaholic is hosting. This is still one of my very, very favorite challenges. I finished up a lot of challenges last year so my list this year is quite smaller, but if I can get a lot read in some other series then I may feel able to take them on next year. 1) The challenge starts January 1, 2011 and ends December 31, 2011. 2) You must read 3 or more books for this challenge. 3) With these books, you should finish the series or at least be up to date with it. 4) Crossovers with other challenges are perfectly alright. 5) Post a review on your blog and leave a link at the post I will set up on January 1, so I can keep track and others might find new series to enjoy. Elena is hosting the Shakespeare Reading Challenge. I’ve participated in a Shakespeare Challenge in the past and still have so many plays to finish reading. I’ve decided to do level 2 (Desdemona) and read 6 plays, most likely in addition to seeing 2 or 3 performances at our local Shakespeare theatre. 3. You don’t need to list your plays ahead of time but you may, if you’d like. ** Pick 12 books – one for each month of the year – that you’ve been wanting to read (that have been on your “To Be Read” list) for 6 months or longer, but haven’t gotten around to. By the end of the year you should’ve knocked 12 books off of your TBR list! You can read additional rules on the challenge post. I just finalized my list using books from last years challenge and a few others that I didn’t get around to. I also made my alternatives books I know I will be reading regardless but have the extra challenge of making sure those 12 are not my entire challenge. This year my goal is to read all 24! Loved this challenge again in 2010 and just finished my list for 2011 that I need to post ASAP. I didn’t do as well as I hoped, and had a hard time getting the mood for these books. I just barely made it but enjoyed it none-the less. 5 books of the original list and 7 off the alternative list. Whew! 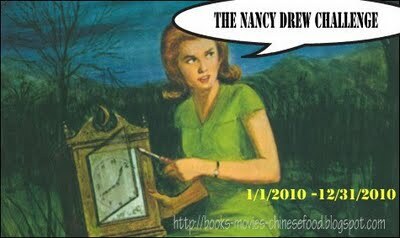 In 2010, Deborah at Books, Movies and Chinese Food hosted The Nancy Drew Challenge where participants are encouraged to read all 56 original Nancy Drew Mystery stories. I barely made a dent but really want to finish the series, so I’m carrying it over into 2011 as a personal reading challenge. I’ve already started book 20 and have about six from the library plus most of the rest in my own collection that I’ve been storing up. Looking forward to getting this one finished!